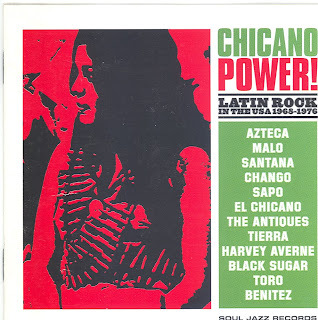 Latin rock & the Chicano Power Movement. Santana, Azteca, Malo, & more. The story of Latin rock in Los Angeles, San Francisco, New York & Miami. thx, bought this some time ago and stupidly took it to cash converters, must have been in a bad mood when i listened or was too obsessed with hc, anyway too much info - i want to listen with more mature ears, so thx again!